Charles was born on 15 November 1760, the son of Samuel Mansfield, a dockyard officer at Plymouth Dock, and was baptised on 13 December 1760 at Stoke Damerel, Devon. With three elder brothers in the Navy, it is not surprising that Charles also joined, but he fared better than his brothers. William Morshead Mansfield (born 1754) was made Lieutenant on the 16th December 1776, but was drowned on the 31st October 1777 when the Pegasus was lost without trace off Newfoundland. Philip Mansfield (born 1755) was made Lieutenant on the 8th October 1777 and died just 9 years later in 1786, age 31. Charles' younger brother, Barrington Mansfield (born 1762), also joined the navy, was made Lieutenant on the 1st April 1780 and died in 1801. Another brother, George Vincent Mansfield (born 1758), progressed to Midshipman but then became a Lieutenant in the Marines, and also died young in 1784. Two more brothers, John (the eldest) and Samuel, followed in their father's footsteps becoming shipwrights (and were probably apprenticed to their father). John moved to Sheerness, becoming Master Boatbuilder, while Samuel remained at Plymouth Dock. More information on the family is in the family tree. Charles J. M. Mansfield entered the Navy at the age of eleven on the 4th June 1772 as Captain's Servant to Charles Feilding, Captain of the Kent, a guard-ship at Plymouth (ADM 36/7614). He was on board when the Kent took part in the royal review of the fleet in 1773. In July 1774, while sailing out of Plymouth Sound, the Kent fired a 13 gun salute to the admiral when the powder chest on the poop blew up, killing 8 seamen and 2 marines and wounding 20 seamen and 19 marines. The ship was severely damaged and returned to the dockyard for repairs. On 1st September 1775, Charles Mansfield joined the Foudroyant as Captain's Servant to John Jervis, later Admiral Earl St Vincent, who two months later rated Mansfield as Midshipman (ADM 36/8343). 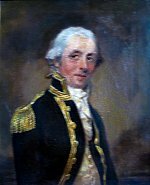 On the 16th March 1779, he transferred to the 74-gun Sultan (ADM 36/8584) under Captain Alan Gardner (later Admiral Lord Gardner), again as 5th Lieutenant, and on the 6th July was in action in the Battle of Grenada, when Vice Admiral Byron attacked the French fleet of 25 ships of the line under Admiral Comte d’Estaing. Admiral Byron sent the British fleet of 21 ships of the line into attack without first getting into formation and the battle must have been a "baptism of fire" for Mansfield at the age of 18 and just a few months after being made Lieutenant, because the Sultan headed the first group of three British ships to reach the French line, resulting in heavy casualties as it was some time before the rest of the British fleet arrived to give support. The battle was indecisive, with no ships lost on either side, but several British ships were severely damaged. The British casualties were 183 killed and 346 wounded, and French casualties numbered 190 killed and 759 wounded. The Sultan's casualties were 16 killed and 39 wounded. Strategically it was a victory for the French as the British failed to recapture the island of Grenada. On the 18th December 1779, the Sultan was present at the engagement between Rear Admiral Hyde Parker's fleet and Admiral La Motte-Picquet. The British sailed from Gros Islet Bay, St Lucia, in pursuit of a convoy of French supply ships heading for Fort Royal, Martinique, capturing nine and forcing four ashore before three ships of the French fleet emerged from Fort Royal. Working to windward, only the Conqueror and Albion managed to get closely engaged with the enemy. The Sultan's role in the action was to send in boats to burn the French supply ships driven ashore, and providing covering fire for this. Two days later, Rear Admiral Rowley detached from the fleet in the Suffolk, together with the Vengeance, Magnificent and Stirling Castle, in search of three French ships which had been sighted. The ships proved to be frigates and all three were captured. One of them, La Fortunée, captured by the Suffolk on the 21st December, was to provide Mansfield with his next appointment. Charles Mansfield continued to serve in the Sultan for another month until the 22nd January 1780, and then transferred as 1st Lieutenant to the frigate La Fortunée under Captain Hugh Cloberry Christian, who had been flag captain to Rear Admiral Rowley in the Suffolk during her capture, and who was given command of the prize. The frigate was present carrying messages between ships of the line at the Battle off the Chesapeake, also known as the Battle off the Capes of Virginia, on the 5th September 1781. Although the battle was itself indecisive, it proved a pivotal point in the war as the failure to relieve General Cornwallis then resulted in the surrender of the British forces at Yorktown. In January 1782, Mansfield was in action in Sir Samuel Hood's skilful but unsuccessful attempt to relieve St Kitts, which had been invaded by Admiral le Comte de Grasse and General le Marquis de Bouillé. The British frigates carried the troops from Antigua under the command of General Prescott, who used La Fortunée as his headquarters. On the 25th January, having drawn the de Grasse away from the anchorage at Basseterre Road, Hood managed to occupy the anchorage in a brilliant manoeuvre while engaged with the superior enemy fleet. The following day, the British fleet successfully defended their position against two further attacks from de Grasse, and then held the anchorage for a further three weeks. On the first night, Mansfield and an army lieutenant successfully made their way through enemy lines to communicate with the garrison, besieged in the fort at Brimstone Hill, but the British had insufficient troops to relieve the garrison, and all further attempts to reach the fort were unsuccessful. Brimstone Hill eventually fell after holding out for a month, and the entire British fleet, unable to assist further, escaped under cover of darkness in another masterfully executed manoeuvre. A full account of the battle of Frigate Bay and the siege of Brimstone Hill is published in the 2008 edition of the Trafalgar Chronicle. Mansfield served on La Fortunée until the 11th September 1782, when after arriving at New York, he was appointed 2nd Lieutenant of the 32-gun frigate Southampton (ADM 36/8531) for her sailing to England. She sailed on the 16th September, arriving at Spithead on the 18th October before proceeding on to the Nore and Sheerness, anchoring on the 30th October 1782, and being paid off on the 23rd November. The Fortunee's 1782 logbook kept by Lieutenant Charles John Moore Mansfield is now held at Boston Public Library (Massachusetts). Mansfield then joined the newly commissioned Irresistible as 3rd Lieutenant on the 3rd April 1783, again under Captain Bowyer, stationed at Chatham to guard the Medway, and later under Captain Andrew Snape Hamond. He served until in the Irresistible until March 1788 (ADM 36/10539, ADM 36/10540 & ADM 36/10541). The Irresistible was a 74-gun ship, built in 1782 and in service until 1806. Their first child Seymour Herbert Mansfield was born on the 5th December 1789, and baptised on the 1st February 1790 at St. Nicholas church, Rochester. He died in 1802, aged 12, and was buried at St Margaret’s Church, Rochester, on the 6th February 1802 (the burial record in the parish register is very faint, and barely legible). Mansfield joined the Lion as 1st Lieutenant on the 12th June 1790 (ADM 36/11036). His second child, Mary Mansfield, was baptised on the 10th January 1792 at St. Nicholas church, Rochester. He joined the Assistance (50-guns - built 1781, wrecked 1802) as 1st Lieutenant on the 12th April 1792, serving under Captain John S Smith. (ADM 36/12201) Mansfield's son, Seymour Herbert, is listed in the ship's muster as present from 12th April to 28th June 1792, and we presume he had his family on board while in port. He was in command of the 14-gun fire-ship Megaera from July 1793 to July 1794 at Spithead & the Channel station. Charles' and Anna's third child, James Hawkins Hughes Mansfield, was born on the 5th April 1794 and was baptised on the 2nd April 1795 at St. Nicholas church, Rochester (presumably shortly before Captain Mansfield sailed for the West Indies in the Andromache - see below). From the 9th July to the 3rd September 1794 he took over command of the Ramillies (74-guns, built in 1785) from Captain Henry Harvey. (Source: NBD) Captain Harvey had just been promoted to Rear Admiral of the Blue on the 4th July, after commanding the Ramillies at the Glorious First of June (also known as the Third Battle of Ushant). Charles Mansfield was promoted to Captain on the 4th October 1794. In 1795 the Andromache was in the West Indies. The National Maritime Museum has an extract from his logbook for the 29th July 1795 when the Andromache sailed through the eye of a hurricane, surviving with some considerable damage, and continuing on to Halifax. In 1796-97 he commanded the frigate Andromache in the Mediterranean. On 31st January 1797 he captured an Algerine corsair of 24 guns who mistook the Andromache for a Portuguese frigate. Algiers was one of the Barbary States who financed themselves by piracy, but Britain maintained a peace through a combination of British naval power and protection payments. When Mansfield hailed the corsair, he was answered in Spanish, so he opened fire, thinking the ship was Spanish. There was a fierce fight, and the corsair surrendered after losing 66 killed and 50 wounded, mostly incurred during an attempt to board the Andromache. The mistake cost the Andromache 3 killed and 6 wounded. In a letter from Jervis to Spencer, 1st Lord of the Admiralty, on the 27th April 1797, Jervis reports that "Captain Hope is charged with the co-operation in the Adriatic, and has under his orders the Romulus, Thalia, Andromache and Meleager, all remarkably well manned, and the three first named ably commanded; the last not ill, Captain Ogle only wanting a little more steadiness." Jervis was not an easy man to please, so the description of the Andromache as ably commanded was an important testimonial to Mansfield's ability. (source: Navy records Society, "Publications of The Navy Records Society Vol. XLVIII. The Spencer Papers Vol. II. ", 1914) In the same letter, Jervis says that he is not competent to decide whether taking possession of the Island of Tenerife would be of much importance in this stage of the war, but that the enterprise is practicable. Nelson subsequently lost his arm in the failed attack a few months later. The Times reported on September 29th 1798: "It is with pleasure we state that the homeward bound fleet from ELSINEUR is safe arrived off Scarborough, under the convoy of the Andromache frigate, of 32 guns, Capt. Mansfield." From February 1799 to June 1802 he commanded the 36-gun frigate Dryad (built in 1795 at Deptford). 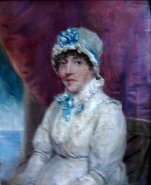 From the memoirs of one of his midshipman, we learn that Mansfield's wife and two unruly children were living onboard the Dryad at Portsmouth, his wife dressing in her own version of an officer's uniform, with epaulettes, but also a black scarf and a man's round hat with a cockade. But despite her eccentric dress she was apparently well liked, and did not interfere with the ship's business, unlike other captains' wives. Soon, the Dryad sailed for Cork, escorting a convoy of merchant ships. On the 19th September 1799, the Dryad captured the Ceres, a French merchant ship en route from Bordeaux to the Caribbean. The Times on January 6th 1800 reported: "The Dryad frigate, Captain MANSFIELD, sailed from Cork on the 4th of December, with the following transports under convoy, having on board troops for MINORCA:- The Commerce, BISHOP, of Chichester; Uncle Toby, BOWEN, of New York; Friends, CHRISTIAN; Juno, M'CARTHY; and Sea Nymph, SOLTAU, of Cork. It is supposed that these troops are destined to replace the garrison of Minorca, the principle part of which are employed in the reduction of MALTA." 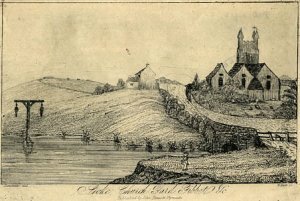 The Dryad was based at Cork for several months during 1800, in Admiral Lord Gardner's fleet. Gardner's son Valentine commenced his naval career in the Dryad under Mansfield. In 1801 Mansfield captured the Swedish frigate Ulla Ferson and the French privateer Premier Consul, which he brought back from the Irish station to Portsmouth as prizes on the 18th March 1801. Click here for Mansfield's letter to Admiral Lord Gardner and newspaper reports. After the peace treaty was signed with the French Republic in March 1802 Mansfield arrived back in Portsmouth on the 9th June in the Dryad bearing the flag of Admiral Lord Gardner (Naval Chronicle vol VII). Captain Mansfield commanded the 74-gun Minotaur from the 11th March 1803 to 17th November 1807. In May 1803 the Minotaur was with the Western Squadron of the Channel Fleet. On the 28th May, only a few days after Britain declared war on France, Captain Mansfield, in command of the the Minotaur, and together with the Thunderer and Albion, captured the French 40 gun frigate La Franchise bound for Brest from St. Domingo, carrying a French general. Click here for Mansfield's letter to the Admiralty. The Franchise remained in service in the British fleet until 1814. Just three days after taking La Franchise, commencing on the 1st June, Mansfield then proceeded to capture 5 prizes within 3 days: the French Concorde on 1st June, the French Prudence, the Dutch Lust Rust and the Dutch Meyzorg on the 2nd, and the French La Therese on the 3rd. The Minotaur then returned to Plymouth to collect her prize crews, the Naval Chronicle reporting on the 6th June: "Came in his Majesty's ship Minotaur, of 74 guns, Captain Mansfield, from a cruise, for the purpose of collecting her officers and men, sent in her prizes; she might have taken a great many more, but had no hands to board them." Mansfield commanded the Minotaur at the battle of Trafalgar in 1805 and in conjunction with the Spartiate captured the Spanish 80 gun Neptuno. Awarded the Naval Gold medal, thanks of Parliament, and sword of honour from the Lloyds Patriotic Fund. The medal and sword are on loan to the National Maritime Museum from the Mansfield family. Mansfield remained off Cadiz with Collingwood for nearly a year after Trafalgar, and from the 27th June to the 22nd September 1806 the Minotaur carried the flag of Rear Admiral Purvis, Collingwood's second in command. Mansfield then returned to England towards the end of 1806, and suffering from severe Rheumatism, took advantage of the Minotaur's refit to take the waters at Bath before returning to his home. ....I hope you will bring your honest face here - but if you should not - tell me if I can do anything for you and I will most gladly attend to your wishes...."
"....whenever you have been well pinched with cold - and tired of the North Sea, I hope the Minotaur will be sent out here when I shall be truly glad to see you. I have it strongly in my mind that this will be an action station - and there is none whose support in the day of trial I would more respect or who I would be more glad should partake of the glory with which I hope the sun will set on that day - than yourself..."
Collingwood also wrote much about ship design in his letters, complaining about the new fashion for "wall-sided ships" and the removal of poop decks. It is easy to understand his choice of Mansfield as a correspondent on the subject, given Mansfield's father and two brothers were shipwrights, and that Mansfield spent his childhood in the Royal Dockyard at Plymouth. Sadly we don't have Mansfield's replies, but Collingwood expresses his commiseration the the Minotaur had been un-pooped during her refit. Mansfield captained the Minotaur in the expedition to Copenhagen in 1807, carrying the flag of Rear-Admiral Essington. Immediately on the Minotaur's return from Copenhagen, late in 1807, Mansfield wrote to the Admiralty asking to be relieved of his command because of his ill health, and retired from active service. He died on 23rd April 1813, aged 52. Buried: St Margaret’s Church, Rochester, Kent, where there is a wall monument in his memory. In fiction, Captain Mansfield appears as a character in the book "Hornblower and the Hotspur" by C.S. Forester.